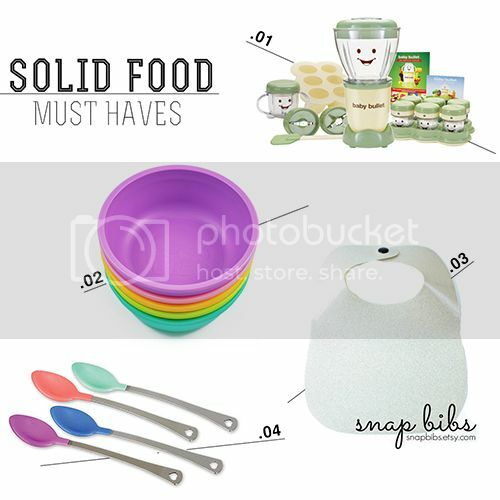 Confetti Babe: BABY SOLID FOOD MUST HAVES. If you follow me on Instagram, you know that this past week we started solid food for Kendalynn. She is NOT taking to it very well, but I've had some amazing tips from all of my momma followers! I did some research before buying her bowls and spoons and I loved the fact that these bowls are super colorful and they're made out of recycled milk jugs! They're BPA free and tested for safety. The spoons are AWESOME. They have pretty colors and the tip turns white if the food is too hot. All you have to do is stir the tip around for ten seconds and if it's white, you need to wait for it to cool. That is awesome because I am paranoid when it comes to things hurting my baby, and this makes me feel so much better when heating things up for her. Some moms recommend the Baby Bullet, which I might pick up this weekend. It sounds amazing and when you compare using this method to make baby food compared to buy food jars (which have additives in it) it saves you sooo much money. Plus, I KNOW her food will be organic. We need to get it this weekend because I think I am going to try veggies with Kendalynn this coming up week. She's just not loving oatmeal cereal, which I am finding out that a lot of babies really don't like it until they're older. Snap Bibs just added me on Instagram and I went to check out their stuff... why have I never heard of these before?! The concept is amazing and as soon as she opens her store, I am definitely going to be browsing through their merchandise. What are your favorite feeding tools? Notice I didn't put a high chair... we're still debating on which one to get! Any suggestions? And as always, I have a Friday Freebie. I plan on storing my baby food in 4oz mason jars. Here are some cute printable labels I made for them! CLICK HERE TO DOWNLOAD.